Timing is one of the most important aspects of the game. It can both work for and against you, but it depends on how you set your cards up. Missing timing in Yu-Gi-Oh! can mean you lose the opportunity to use/chain to an effect. It is usually due to an effect activating in the middle of a chain. Another form of missing timing is due to simultaneous effect occuring and a certain card wants to activate in the middle of it. Card effect that miss timing do NOT activate. Now I know this is all confusing but I'll explain as we go. You can identify these monster with optional Effects when they have in their text: "When this card is.... You can... " or something close like that. It is an Optional Trigger. The main reason cards miss timing is because their effects are optional and theyre conditions are NOT the last thing to happen. This mostly concern trigger effect monsters. For an optional effect monster to not miss timing it must either be in its own chain alone or be the final chain link. Also the best way to avoid missing timing is by not using it for costs and using it for effect that don' have "then" in its text. And be-careful synchro-ing, fusing, tributing for monsters with optional trigger monsters too. Again all will be explained. I'll also explain Mandatory and Unmissable Optional Effects. Here's an example of a card missing timing. Let's start with what happens when you use a monster with an optional effect for a cost. Text: Tribute 1 Plant-Type monster. Negate the activation of a Spell or Trap Card, or the Normal or Special Summon of a monster, and destroy that card. If I tribute Botanical Girl for this effect, the last thing to happen is me negating a card, so Botanical Girl will miss timing, and even if I'm wrong, Botanical Girl's effect can't chain to a counter trap anyways. Text: When this card is sent from the field to the Graveyard: You can Special Summon 1 Level 2 or lower "Gusto" monster from your Deck. Text: Tribute 1 Winged Beast-Type monster to select 2 cards on the field. Destroy them. If I tribute Gulldo for Icarus Attack, the last thing to happen would be me dectroying 2 cards on the field. Even if Gulldo's conditions are pleased, Icarus Attack is still resolving and Gulldo cannot cut in the middle of its effect. 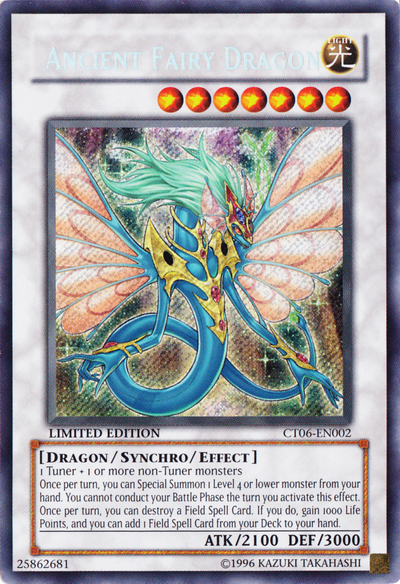 Although Polymerization (except Super Polymerization), Synchro, Tribute Summon, and Ritual Cards do not have (or aren't considered as) costs, Optional Trigger Effects will miss timing if they are part of this situation. Why? It because the last thing to happen is a monster summon. Text: When this card is Tribute Summoned: Target 1 card on the field; banish that target, and if you do, inflict 1000 damage to your opponent if it was a DARK monster. Text: This card's name is treated as "Des Frog" while it is face-up on the field. Your opponent cannot select another monster as an attack target. When this card is sent from the field to the Graveyard, you can add 1 "Frog" monster except "Dupe Frog" or "Frog the Jam" from your Deck or Graveyard to your hand. If I tribute Dupe Frog, I have fulfilled Dupe Frog's condition and SHOULD be able to search, but, since I have yet to summon a monster after tribute, the last thing to happen is Caius's tribute summon. Text: When this card is sent from the field to the Graveyard: You can target up to 2 of your banished "Elemental HERO" monsters; add those targets to your hand. Text:Send Fusion Material Monsters that are listed on a Fusion Monster Card from your hand or your side of the field to the Graveyard, and Special Summon that Fusion Monster from your Extra Deck. When I send Elemental Hero the Shining to the grave, his effect will take place but since he cannot interrupt in the middle of a resolving card effect, his effect will miss timing because of that and a new monster summon. Although this is not the most common, optional trigger effects can miss their timing because they activate in the middle of a chain. Let's use a common situation. Text: Both players can Tribute Summon "Ancient Gear" monsters with 1 less Tribute than required. 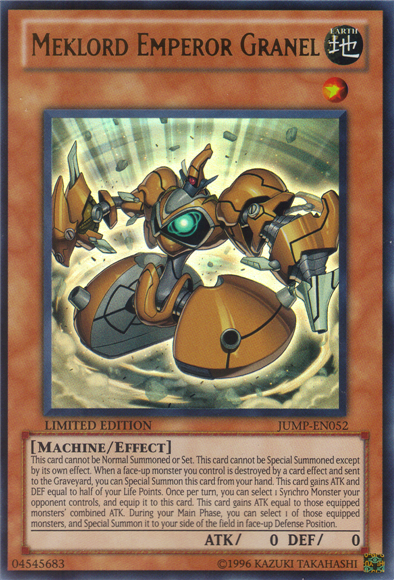 When this card is destroyed and sent to the Graveyard: You can Special Summon 1 "Ancient Gear" monster from your hand, Deck, or Graveyard. Text: Target 1 Spell/Trap Card on the field; destroy that target. Now if I activate Geartown and my opponent responds with Mystical Space Typhoon, I would miss timing. Why? Here's a diagram. Player 2: In response chains Mystical Space Typhoon and targets Geartown. Chain Link 1: Geartown activation completes. So, because Geartown was destroyed in the middle of a chain, it did not get its effect. Here's another example with some card you should be familiar with. Text: When this card is Synchro Summoned, you can destroy all cards on the field. Once per turn, you can remove from play 1 Plant-Type monster from your Graveyard to change 1 Defense Position monster your opponent controls to face-up Attack Position, and reduce its ATK to 0 until the End Phase. Formula Synchron is the master of miss timings. If you synchro with him in response to a card effect, it'll start a chain and chances are a monster with a trigger optional effect will miss timing. Player 1: In response chains Formula Synchron's effect. Chain Link 1: Mind Control takes control of Formula Synchron, but Formula Synchron is no longer on the field. If a card effect has the word then in it, that means it'll take place after one part of the effect is done. If you fulfill a card effect with a another card effect that has "then" in its text, then most likely it will miss timing. Text: Once per turn, you can Special Summon 1 Level 4 or lower monster from your hand. You cannot conduct your Battle Phase the turn you activate this effect. Once per turn, you can destroy a Field Spell Card. If you do, gain 1000 Life Points, and you can add 1 Field Spell Card from your Deck to your hand. Text: Face-up "Meklord Emperor" monsters you control cannot be targeted by the effects of Synchro Monsters. When this card on the field is destroyed and sent to the Graveyard, you can add 1 "Meklord Emperor" monster from your Deck to your hand. If you destroy Meklord Fortress by Ancient Fairy Dragon's second effect, you will destroy and gain life points simultaneously, so the last thing to happen would be both Meklord Fortress's condition and gaining life points, but Ancient Fairy Dragon's effect is not over; you still have to decide whether you want to add 1 field spell or not. If you choose yes, you would miss timing because the last thing to happen is adding a new field spell. If you choose no, as I stated earlier, the last thing to happen is Meklord's Fortress's destruction and gaining life points, so you get Meklord Fortress's effect. Text: FLIP: You can target 1 card on the field; destroy that target. Send the top 3 cards of your Deck to the Graveyard. Text: This card cannot be Normal Summoned or Set. This card cannot be Special Summoned except by its own effect. When a face-up monster you control is destroyed by a card effect and sent to the Graveyard, you can Special Summon this card from your hand. This card gains ATK and DEF equal to half of your Life Points. 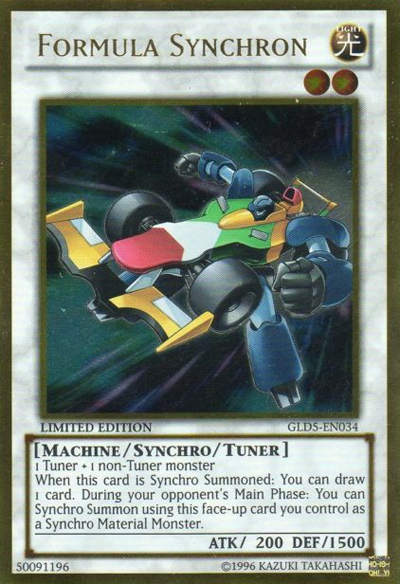 Once per turn, you can select 1 Synchro Monster your opponent controls and equip it to this card. This card gains ATK equal to those equipped monsters' combined ATK. During your Main Phase, you can select 1 of those equipped monsters, and Special Summon it to your side of the field in face-up Defense Position. If Player 1 Flip Summon's his/her own Ryko and destroys a monster on Player 2's field while he/she has Meklord Emperor Granel in his/her hand, he/she will miss timing to special summon it because the last thing to happen is Ryko's milling portion of the effect. This may not be miss timing(or not recognized as miss timing), but if you are able to fulfill two effects at the same time you can halt an opponent's card response. Although its not common, its do-able. This is usually a technique to get over cards like Solemn Warning and Bottomless Trap Hole. Text: You can Special Summon this card from your hand or your Graveyard by removing from play 1 face-up monster you control equipped with a "Dragunity" card(s). 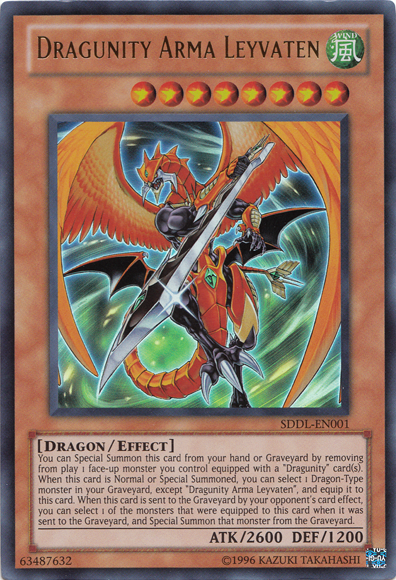 When this card is Normal or Special Summoned, you can select 1 Dragon-Type monster in your Graveyard, except "Dragunity Arma Leyvaten", and equip it to this card. When this card is sent to the Graveyard by your opponent's card effect, you can select 1 of the monsters that were equipped to this card when it was sent to the Graveyard, and Special Summon that monster from the Graveyard. Text: This card cannot be Normal Summoned or Set. This card cannot be Special Summoned except by its own effect. When a face-up monster you control is destroyed by a card effect and sent to the Graveyard, you can Special Summon this card from your hand. Other monsters you control cannot declare an attack. 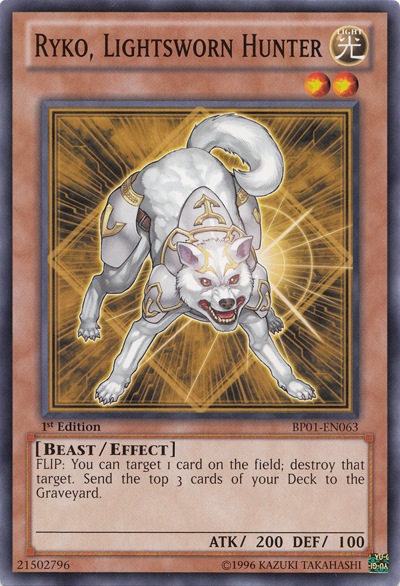 Once per turn, you can select 1 Synchro Monster your opponent controls, and equip it to this card. This card gains ATK equal to those equipped monsters' combined ATK. You can send 1 monster equipped to this card to the Graveyard to allow this card to attack your opponent directly this turn. Text: When a monster would be Summoned, OR when a Spell Card, Trap Card or Effect Monster's effect is activated that includes an effect that Special Summons a monster(s): Pay 2000 Life Points; negate the Summon OR activation, and destroy that card. Player 1 has Meklord Emperor Skiel in hand and Dragunity Arma Leyvaten on the field equipped with Red Eyes Darkness Metal Dragon. Player 2 has Dark Hole in hand and Solemn Warning facedown. Player 2 activates Dark Hole; destroying Dragunity Arma Levyaten and sending it to the graveyard. Now Meklord Emperor Skiel's effect and Dragunity Arma Levyaten's effect conditions are fulfilled and activate simutaneously. Since they are both optional trigger effects, you can decide which card is Chain Link 1 and Chain Link 2. Player 2 has Solemn Warning facedown so he/she can negate one of the card's effects, but it is not his/her choice since which ever card effect is Chain Link 2 is the one he/she can negate. Text: Each player discards their entire hand, then draws the same number of cards they discarded. If Player 1 activates Card Destruction and discards Goldd, Wu-Lord of Dark World and Broww, Huntsman of Dark World, both Goldd, Wu-Lord of Dark World and Broww, Huntsman of Dark World effects will activate in a chain. Supposing Player 2 has Bottomless Trap Hole. Now like in the example above, since they have the same timing, you can configure the Chain Link. If you make it so Broww, Huntsman of Dark World is Chain Link 1 and Goldd, Wu-Lord of Dark World is Chain Link 2, the last thing to happen in a chain is drawing one card from Broww, Huntsman of Dark World, so the Player 2 cannot activate Bottomless Trap Hole to destroy Goldd, Wu-Lord of Dark World; therefore Bottomless Trap Hole misses timing. Finally we can move on to cards that will NEVER miss timing no matter how convaluted it seems. Fortunately for me, it'll be very short. Mandatory effects are effects that MUST happen once a condition is fulfilled and will never miss timing; the only downside is you can't choose to stop it. Mandatory effects activate in their own chain instead of continuing a current one. Mandatory effects do not have the word "can" in its text. 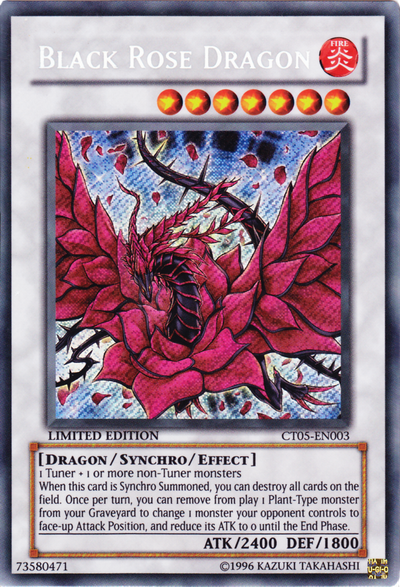 You will recognize this card since it is the most popular amongst Yu-Gi-Oh players. Sangan can never miss timing because it doesn't give the option to search. There are cards that can never miss timing, but is optional at the same time. They are the cards that have effects that start with "If" and "After" cannot miss timing. Text: This card cannot be destroyed by battle. If this face-up Defense Position card is selected as an attack target, destroy this card at the end of the Battle Phase. 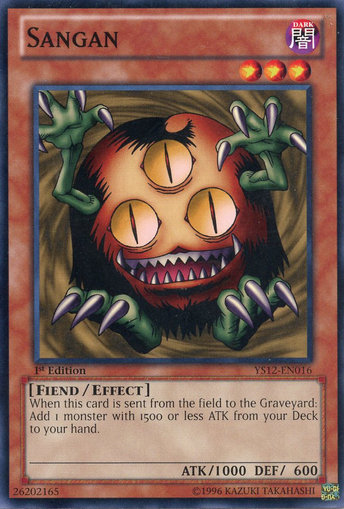 If this card is destroyed by the effect of a "Scrap" card and sent to the Graveyard, you can select 1 "Scrap" monster in your Graveyard, except "Scrap Goblin" and add it to your hand. Under the condition that Scrap Goblin is destroyed by a Scrap effect that Scrap Goblin will allow you to add a Scrap monster from the grave. 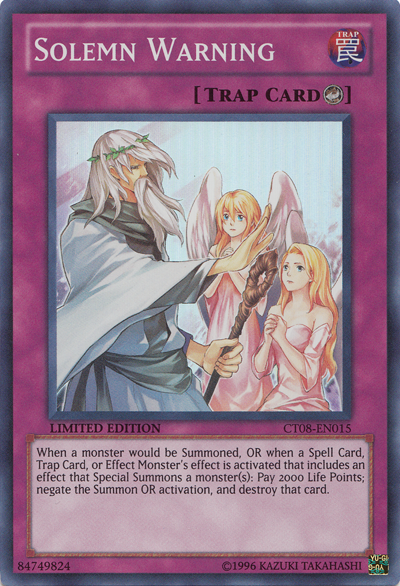 Text: After 1 of your Counter Trap Cards has been activated and has resolved, you can Tribute all monsters you control to Special Summon this card. If this card is Special Summoned in this way, you can destroy cards your opponent controls up to the number of Fairy-Type monsters you Tributed. Only after a Counter Trap will you have the choice for Voltanis, the Adjudicator to special summon itself. If you have any questions or concerns or if I misses anything, please dont hesitate to reply. I will attend to it as soon as I can. » What is "Miss Timing"?